11th lunar month of 1740: he started his career in Ôsaka as a disciple of Anegawa Shinshirô I. His stage name was Anegawa Daikichi and he performed as an iroko. 25th day of the 11th lunar month of 1749: his master Anegawa Shinshirô I died. 11th lunar month of 1750: Daikichi became wakaonnagata and played in Kyôto at Ebisuya Kichirôbê's theater the role of the keisei Koizuru in Fujikawa Sakoku's kaomise drama "Taira no Miyako Onna Ezôshi", which was produced by Sakakiyama Shirotarô II. 1st lunar month of 1751: Daikichi performed in the same theater in Fujikawa Sakoku's ni-no-kawari drama "Keisei Kane-ga-Fuchi". 3rd lunar month of 1751: Daikichi's rank in the Kyôto hyôbanki, wakaonnagata section, was jô-jô (superior - superior). 11th lunar month of 1750: Daikichi played in Kyôto at Miyako Handayû's theater (Minamigawa no Shibai) the role of the keisei Takamura the kaomise drama "Kyôganoko Asahi no Nishiki", which was produced by Sakakiyama Shirotarô II. 1st lunar month of 1752: Daikichi's rank in the Kyôto hyôbanki, wakaonnagata section, was jô-jô-(shiro)hankichi (superior - superior - (white) half excellent). Fall 1752: Daikichi went to Ôsaka. 11th lunar month of 1752: the play "Ichi-no-Tani Futaba Gunki" was staged for the first time in Ôsaka, as a kaomise drama, at the Naka no Shibai; Daikichi plays the role of Kiku-no-Mae [casting]. 1st lunar month of 1753: Daikichi's rank in the Ôsaka hyôbanki, wakaonnagata section, was jô-jô-(shiro)hankichi (superior - superior - (white) half excellent). 11th lunar month of 1753: Daikichi performed at the Ônishi no Shibai in the kaomise drama "Taihei Kiso Monogatari". 12th lunar month of 1753: Daikichi played in the same theater the role of the keisei Misora in the drama "Keisei Ama no Hagoromo". 11th lunar month of 1754: Daikichi played at the Ônishi no Shibai the role of Jûnai's nyôbô Asuka in the kaomise drama "Uda Genji Asahi no Menbako", which was produced by Wakayama Bunshichi; his stage partners were Ichikawa Danzô III, Wakayama Shinkurô, Nakamura Utaemon I, Wakayama Bunshichi, Arashi Sangorô II, Yoshizawa Sakinosuke II, Ôtani Hirohachi I and Someyama Sôjûrô. 1st lunar month of 1755: Daikichi's rank in the Ôsaka hyôbanki, wakaonnagata section, was jô-jô-(shiro)kichi (superior - superior - (white) excellent). He shared the same rank with Yoshida Manshirô and Matsushima Kiyozaki. 12th lunar month of 1755: Daikichi became zamoto at the Kado no Shibai, where he produced the kaomise drama "Hyakumangi Tsuwamono Taiheiki" and in which he played the role of Kôtô-no-Naishi. 11th lunar month of 1756: Daikichi produced at the Kado no Shibai the kaomise drama "Taihei Yamato Monogatari", in which he played the role of Togiya's nyôbô Oshizu. 1st lunar month of 1757: Daikichi produced in the same theater the ni-no-kawari drama "Keisei Kongenki", in which he played the role of Princess Ito. 11th lunar month of 1757: Daikichi played at the Naka no Shibai the role of Matakurobê's servant Oyoshi, in reality Kamata Hyôe's nyôbô, in the kaomise drama "Sakiwake Musha Kôbai no Tazuna", which was produced by Anegawa Shinshirô II. 1st lunar month of 1758: Daikichi's rank in the Ôsaka hyôbanki, wakaonnagata section, was one black stroke above jô-jô-(shiro)kichi [visual]. 11th lunar month of 1758: Daikichi performed at the Kado no Shibai in Namiki Shôzô I's kaomise drama "Arigatashi Fujiwara Keizu", which was produced by Nakayama Bunshichi I. 1st lunar month of 1759: Daikichi's rank in the Ôsaka hyôbanki, wakaonnagata section, was two black strokes above jô-jô-(shiro)kichi [visual]. Fall 1759: Daikichi went to Edo, along with Hanakawa Ichinojô. 11th lunar month of 1759: Daikichi played at the Ichimuraza the role of Okuni in the kaomise drama "Okunizome Shusse Butai"; his main stage partners were Ichikawa Danjûrô IV, Onoe Kikugorô I, Bandô Sanpachi I, Nakamura Utaemon I, Sanogawa Ichimatsu I, Bandô Hikosaburô II, Ichimura Kamezô I, Matsumoto Kôshirô III and Hanakawa Ichinojô. 1st lunar month of 1760: Daikichi's rank in the Edo hyôbanki, wakaonnagata section, was two black strokes above jô-jô-(shiro)kichi [visual]. 11th lunar month of 1760: Daikichi played at the at the Moritaza the role of Ayame-no-Mae in the kaomise drama "Miyo no Butoku Yunzei Kagami". 11th lunar month of 1761: Daikichi played at the Moritaza the role of Akita's nyôbô in the kaomise drama "Misonô Banzei no Hachinoki". 1st lunar month of 1762: Daikichi's rank in the Ôsaka hyôbanki, wakaonnagata section, was jô-jô-(hanshiro)kichi (superior - superior - almost excellent) [visual]. Fall 1762: Daikichi went back to Ôsaka after 3 seasons in Edo. 11th lunar month of 1762: Daikichi played at the Kado no Shibai the role of Kaga no Oume in the kaomise drama "Hachinoki Nendaiki", which was produced by Nakayama Bunshichi I and celebrated the shûmei of Arashi Sanjûrô III. 1st lunar month of 1763: Daikichi's rank in the Ôsaka hyôbanki, wakaonnagata section, was two black strokes above jô-jô-(hanshiro)kichi [visual]. 7th lunar month of 1763: Daikichi played at the Kado no Shibai the roles of Tonami and Yae in the drama "Sugawara Denju Tenarai Kagami", which was produced by Nakayama Bunshichi I; his stage partners were Nakayama Bunshichi I (Matsuômaru, Terukuni), Nakayama Shinkurô I (Kakuju, Shihei), Arashi Hinasuke I (Haru), Fujikawa Hachizô I (Takebe Genzô, Sukune Tarô), Asao Tamejûrô I (Hyôei, Shundô Genba), Nakayama Raisuke I (Umeômaru), Bandô Toyosaburô I (Shiratayû), Ichinokawa Hikoshirô II (Sakuramaru), Yoshizawa Sakinosuke II (Chiyo, Tatsuta) and Nakamura Kichiemon I (Kan Shôjô). 11th lunar month of 1763: Daikichi performed at the Kado no Shibai in the kaomise drama "Kachidoki Aun no Ishizue". 11th lunar month of 1764: Daikichi performed at the Naka no Shibai in the kaomise drama "Tatsu no Miya Yunzei Kotobuki". 12th lunar month of 1765: Daikichi played at the Naka no Shibai the role of Kichibê's nyôbô in the drama "Hatsuyoroi Genji Monogatari". 1st lunar month of 1766: Daikichi's rank in the Ôsaka hyôbanki, wakaonnagata section, was back to jô-jô-(hanshiro)kichi (superior - superior - almost excellent) [visual]. 5th lunar month of 1766: first Kabuki adaptation of the puppet theater drama "Honchô Nijûshikô", which was performed in Ôsaka at the Naka no Shibai; Daikichi plays the role of Otane [casting]. 11th lunar month of 1766: Daikichi played at the Naka no Shibai the role of Yaegiku, later the keisei Nanaura, in Namiki Jûsuke's kaomise drama "Yamato Uta Hikime no Yaguruma", which was produced by Nakamura Utaemon I. 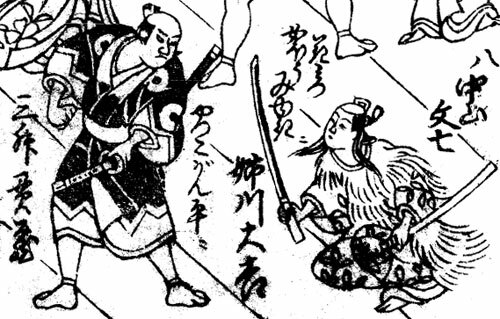 1st lunar month of 1767: Daikichi's rank in the Ôsaka hyôbanki, wakaonnagata section, was one black stroke above jô-jô-(hanshiro)kichi [visual]. 11th lunar month of 1767: Daikichi performed at the Naka no Shibai in the kaomise drama "Shitennô Maizuru Ôgi", which was produced by Mimasu Tanin I. Fall 1768: Daikichi went to Kyôto after 16 seasons spent in Ôsaka or Edo. 11th lunar month of 1768: Daikichi played in Kyôto the role of Ichizô's nyôbô Oike in the kaomise drama "Enmusubi Asahi no Shimadai", which was produced by Onoe Kumesuke. 3rd lunar month of 1769: Daikichi's rank in the Kyôto hyôbanki, wakaonnagata section, was one black stroke above jô-jô-(hanshiro)kichi [visual]. Fall 1769: Daikichi went back to Ôsaka. 2nd lunar month of 1770: Daikichi played at the Kado no Shibai the role of Miyoshi's mekake Oran in the ni-no-kawari drama "Higashiyama-dono Onna Makigari". 3rd lunar month of 1770: Daikichi's rank in the Ôsaka hyôbanki, wakaonnagata section, was two black strokes above jô-jô-(hanshiro)kichi [visual]. 11th lunar month of 1770: Daikichi performed at the Naka no Shibai in the kaomise drama "Ma'ichimonjiya Sakigake Hyôban", which was produced by Ogawa Kichitarô I. 1st lunar month of 1771: premiere at the Naka no Shibai of Namiki Shôzô I's drama "Kuwanaya Tokuzô Irifune Monogatari"; Daikichi played the role of Tokuzô's spouse Koshio [casting]. 11th lunar month of 1771: Daikichi performed at the Kado no Shibai in the kaomise drama "Ganjitsu Eiga no Toshikoshi", which was produced by Ogawa Kichitarô I. 8th lunar month of 1775: the play "Sekitori Senryô Nobori" was staged for the first time in Ôsaka, at the Kado no Shibai; Daikichi played the role of Senbagawa's wife Oyotsu [more details]. 12th lunar month of 1776: premiere at the Naka no Shibai of Nagawa Kamesuke I's drama "Igagoe Norikake Gappa"; Daikichi played the role of Matagorô's sister Sasao [casting]. 4th lunar month of 1777: premiere in Ôsaka at the Naka no Shibai of Nagawa Kamesuke I's drama "Meiboku Sendai Hagi"; Daikichi played the role of Izumi Kojirô's wife Hanafusa [casting]. 9th lunar month of 1783: the play "Igagoe Dôchû Sugoroku" was adapted for Kabuki for the first time, in Ôsaka at the Naka no Shibai; Daikichi played the roles of Yukie's wife and Kôbê's wife Oyoshi [casting]. 11th lunar month of 1786: Daikichi played at the Naka no Shibai the role of Kurando's nyôbô Tachinami in the kaomise drama "Neko Shakkyô Fûki no Hanabusa", which celebrated the shûmei of Nakayama Bungorô I. 15th day of the 1st lunar month of 1787 : Daikichi died in Ôsaka. Anegawa Daikichi I was an Ôsaka onnagata actor, who was active from the beginning of the 1740s to the second half of the 1780s. He was outstanding in karô's nyôbô and courtesan roles. The 15th day of the 1st lunar month of the 7th year of the Tenmei era was the 4th of March 1787 in the western calendar.